SnowpiercerIn 2014, an experiment to counteract global warming causes an ice age that kills nearly all life on Earth. 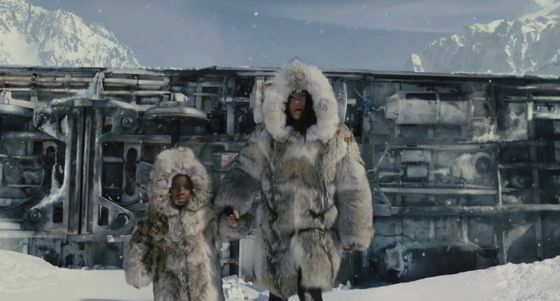 The only survivors are the inhabitants of the Snowpiercer, a massive train powered by a perpetual-motion engine that travels on a globe-spanning track. A class system is installed, with the elites inhabiting the front of the train and the poor inhabiting the tail. The 17-year-old daughter of Namgoong Minsoo. About her character's name, Ah-Sung said, "[Bong] couldn't think of any name for Yona; he just left her as "The Inuit Girl." I gave him Nastyona’s album, and he went "This is it! ", adding, " It also matches the Biblical figure Jonah [pronounced Yona in some languages, including Korean] and had a right feel to it." Ah-sung described Yona as being, "[...] someone who was completely indifferent to Minsu’s ambition. Even if she knew, she wouldn’t have cared." Of Yona's background, Bong revealed, "Yona’s mother was the leader of the Frozen Seven’s revolution--because she was an Inuit. She was confident that she could endure the coldness. However, she went out too early. "Comment: So Yona is Inuit or half-Inuit by blood. Since she's a "train baby," though, she has no knowledge of the Inuit or their cultures. One can easily discern a nature vs. technology theme in Snowpiercer. The rich white people have enclosed themselves in a metal shell, cut off from human suffering and pain. The poor, brown people (even the Caucasian "tailies" are dark with grime) long for a better life that may exist outside the train. And an Inuit woman led the way. She was the first to think a Native approach--living in harmony with, rather than in opposition to, nature--would work. Although it doesn't state an indigenous message explicitly, the movie implies one. Namely, that technological solutions--seeding the atmosphere, running the train--have failed. It's time to step outside the Western comfort zone and experience the harsh realities of life.